When Andrew Smith Hallidie witnessed a horrible accident on a typically damp summer day in 1869, he became the driving force behind the San Francisco cable car system. On August 2, 1873, Andrew Hallidie tested the first cable car system near the top of Nob Hill at Clay and Jones Streets, thus introducing this new transportation system to the world. Trams became an icon of San Francisco, California.The most famous cable cars of San Francisco, are driven by a continuous cable running beneath the street surface. From each car a grip descends through a slot in the roadway; it can be attached to or detached from the cable by the driver's controls. 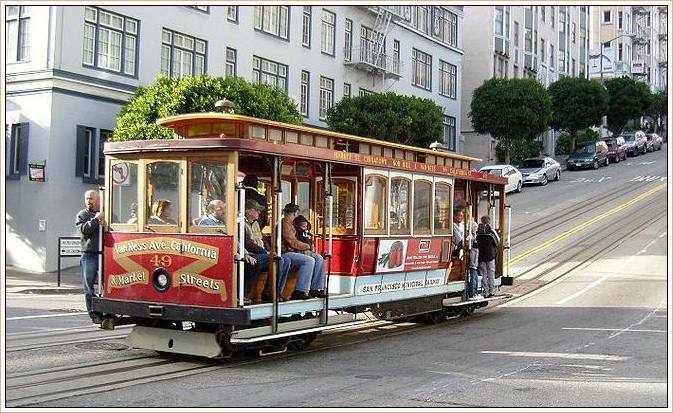 The San Francisco cable car system is the world's last manually operated cable car system. The cable cars are used by commuters, but their low speed, small service area, and premium fares make them primarily a tourist attraction. It is the only transportation system listed on the National Register of Historic Places.